Since one Stephenson has been reviewed and interviewed just about everywhere recently, I thought I’d be deliberately perverse and post an old review of a novel by an entirely different Stephenson. In the late 1970s, Orbit published two novels by Andrew M Stephenson. The first of these was Nightwatch in 1977. While it initially seems very much a British science fiction novel of its time, it did promise a career to watch. Dan Frome is a British engineer sent to Dvornik Moon-base in 2006 to oversee the installation in Jupiter probes of the artificial intelligences he’s invented, the Golems. But this, it transpires, is just a cover story. An alien spaceship has been detected en route to Earth. Frome’s Golems will actually be going into weapons platforms sent out to intercept the alien craft. And everyone on the Moon is stuck there for the duration. The inhabitants of Dvornik are not happy about this involuntary exile, especially since Earth itself is on the brink of war. By the time the weapons platforms are ready and in place, their homes could well have gone up in smoke. Various secret factions within the Moon-base try to recruit Frome. Or kill him: he narrowly escapes one attempt on his life. Making matters more complicated is Frome’s belief that his Golems are not capable of the job for which they are being used. There is a fundamental flaw in their thought processes. Frome manages to persuade his superiors that someone has to accompany the weapons platforms, and be there with them to oversee the Golems. He is the only man for the job. At which point, the narrative of Nightwatch abruptly shifts from its earlier first-person to third-person. Frome is sent out with the weapons platforms to Jupiter orbit. The alien craft draws near. One by one, the Golems malfunction. Frome brings them back on-line, and succeeds in returning enough functionality to them so they can attack the alien. But the weapons platforms seem to have no effect. 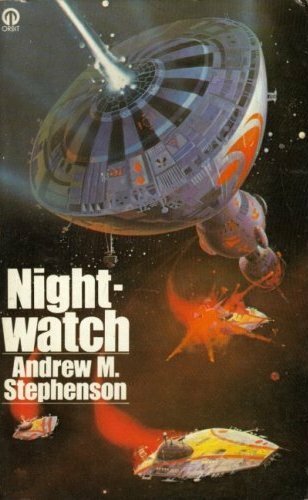 Up to this point, Nightwatch could best be described as 1970s hard science fiction. Perhaps more literate than others of its ilk – as testified by its first-person narrative, and the switch to third-person – there was little in Nightwatch‘s story which differentiated it from similar novels of its time. But the aftermath of the attack on the alien craft marks an abrupt change in science fiction mode. The alien, Frome learns, is a trader, and it carries a portal linking it to a vast galactic transport network. Frome passes through this portal… and discovers a galaxy rich in life, with a civilisation so old that its beginnings are long forgotten. No one, in fact, remembers who built the original transport network. There are echoes of 2001: A Space Odyssey in this, but there is also something about the concept which reminds me more of late 1980s and early 1990s science fiction by the likes of David Brin, or William Barton and Michael Capobianco. Frome returns to Earth in the alien craft. The narrative returns to first-person. Earth has destroyed itself, but Dvornik Moon-base still survives. However, the planet can be rebuilt with the alien traders’ help. Until that odd shift to space opera and pan-galactic civilisation. While this shift fits within Stephenson’s story, it’s certainly not signalled by anything which has gone before. The mix of dour hard SF and optimistic space opera works well – and there’s a nice dichotomy at work, in the appearance of these galactic saviours as Earth bombs itself into oblivion – but only a persistent reader would get far enough to discover this. Perversely, I think Nightwatch probably reads better now than it did thirty years ago. With a little updating, Nightwatch would not appear out of place on the science fiction shelves of today’s book shops. Which may be why Stephenson wrote only a pair of novels before falling silent. He was ahead of his time. Categories: andrew m stephenson, book review, books, science fiction | Permalink.